Owners of the 32 NFL franchises decided to augment the policy of protesting the National Anthem to punish players who publicly demonstrate during the playing of the song. 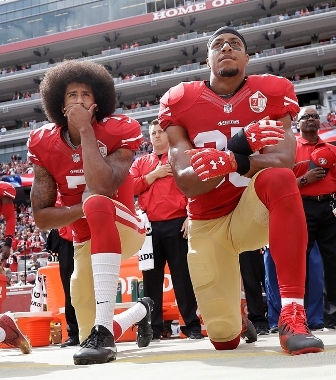 The new policy allows the league to fine teams for protesting and allows players the option to stay in the locker room while the national anthem is being played. The policy leaves teams to decide what actions are respectful or not and reprimand players who conduct themselves in what a franchise may consider as “disrespectful” when the “Star Spangled Banner” is being played. The NFL Players Association was not consulted on the change of policy until after it was finalized during a two-day owners meeting. Many NFL players expressed their disdain of the new policy. On Friday, many Civil leaders and Social Justice groups protested in front of the NFL headquarters in New York. Speakers during the protest equated the NFL to a plantation system.